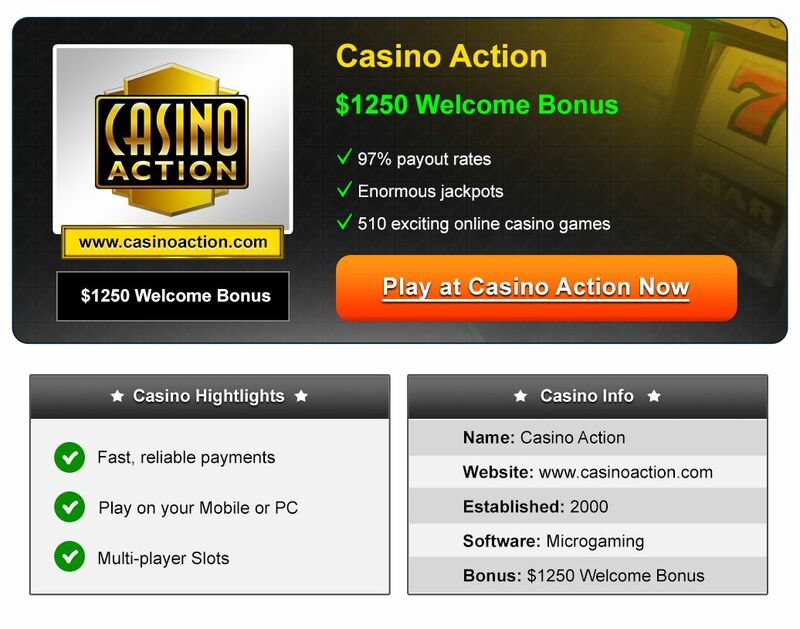 One of the biggest online casinos to find a spot in the Casino Rewards Group is Casino Action. Its classy gold-on-black theme offers an appealing entrance, and once inside we found the appeal continued to grow. With Casino Action being a part of the Casino Rewards group of casinos, you know that you are playing at a casino that is run by one of the largest and most experienced groups around. This provides confidence that you are playing at somewhere that is safe and fair to play at, which is also backed up by the eCogra seal of approval too. Since Casino Action is powered by Microgaming, and uses their excellent range of games, you will find over 500 state-of-the-art slot and table games ready for you to play. Another great thing about Casino Action is that they offer a very wide range of bets on their games, so whether you a brand new and just want to try a few Dollars/Euros/Pounds, or you are an experienced high-roller, you will be able to find the betting limits to suit. Casino Action’s range of slot games is vast. There are several different types of slot games to choose from, including video, three-reel and video poker. Some of the most iconic slot games that you can expect to play like Thunderstruck II slot and Avalon slot are available here. We also counted 15 progressive jackpot games (apparently there are 16, but we couldn’t find the last one) in the casino too. These include the Mega Moolah slot, which has a 7-figure jackpot that regularly goes up into the multi-million range. Anyone can play this game too, you don’t have to be a high roller and you don’t have to play big bucks either. The sign up bonus on offer at Casino is very appealing. On registering you’ll be given $1,250 as casino bonus. You can use this amount to play some of the games available so you can get a good feel of the casino itself, and also the games on offer. By acquiring an eCogra Safe & Fair Seal of Approval, Casino Action is deemed a safe and trustworthy online casino to play at. We came across the audit reports by eCogra displayed on the site and were glad to know that all were up-to-date. They have percentage payout review certificates and randomness review certificates all present. The casino has a very comprehensive FAQ section on their website. So if you have any question you can always see if the answers are there. But if you don’t find the right answers to your query, you can contact their customer support team who are very knowledgeable and helpful. They are available 24/7 on live chat as well as through the phone. You also have an option of emailing them too. Overall we found our experience at Casino Action to be a very positive one. It has such a wide variety of games available, and the casino is also available for people to play on their computers and on mobile devices too. We also liked the fact that the casino will be enjoyable for players of all levels.